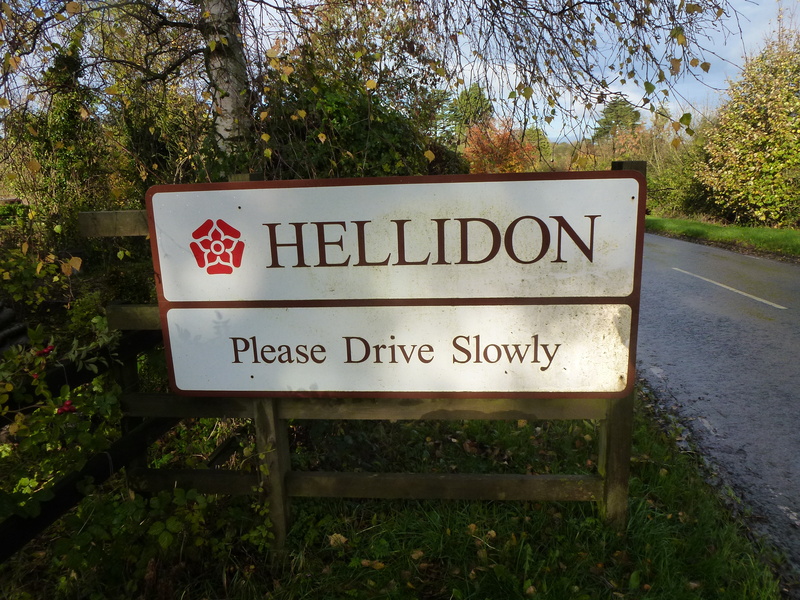 Hellidon is a village and civil parish in the Daventry district of the county of Northamptonshire in England. The 2011 Census recorded a population of 256. The village reached its highest population, 449, in 1861. The village is located about five miles south-west of Daventry, south of the A425 road. It is on the watershed of three major rivers: the Leam (to the Bristol Channel), the Cherwell (to the Thames Estuary), and the Nene (to The Wash). All have their sources nearby. Hellidon used to be the centre of an ironstone quarrying industry until the 1950s and an industrial railway operated in the area, which conveyed ironstone to the Great Central line at Charwelton. There are now several vineyards in the Hellidon area; one of these is the Windmill Vineyard which accommodates the white tower mill of Hellidon with a silver cap. HELLIDON, a village and a parish in Daventry district, Northampton. The village stands near the source of the Leam, and near the boundary with Warwickshire, 5 miles SW of Daventry, and 7 NE of Fenny-Compton r. station; and has a post office under Daventry. The parish comprises 1, 478 acres. Real property, £2, 827. Pop., 449. Houses, 99. The property is much subdivided. The manor belongs to James Attenborough, Esq. The surface is hilly, and commands beautiful views. The living is a vicarage in the diocese of Peterborough. Value, £105. * Patron, the Rev.S. Holthouse. The church is early decorated English; consists of nave and chancel, with porch and tower; and was recently repaired. There are a dissenting chapel, an endowed school with £20, and other charities with £7.